The nuptial knot of Simi and Adekunle Gold has been all the rage amongst many Nigerians this year. But even more, their honeymoon which is currently underway in South Africa is what is giving many of their fans. Legit.ng has discovered new details about their blissful escapades. 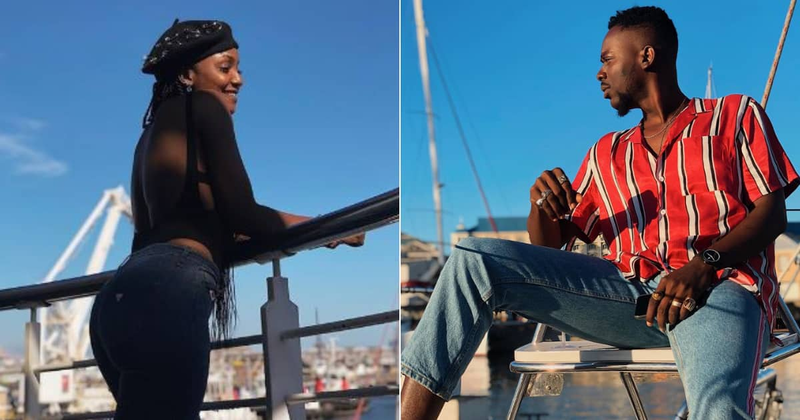 Earlier, a video of Simi walking side by side with Adekunle Gold and rapping out love verses which caused him to blush was shared by Legit.ng. It would appear that the couple were not planning to spend their whole day walking on land. They also decided to have a time out to enjoy themselves on the sea. Hence, they took to boarding a cruise ship which offered them the pleasure of viewing the lovely blue South African sea, enjoying fresh breeze, and of course, expressing their love for one another. Simi, for one, expressed her love bodily. For their sea cruise, she took to wearing a very revealing black, transparent dress that showed her entire back. Then, she topped it with a body-hugging denim jeans and 'weird' pair of shoes that lifted her above the ground. So, one might be wondering why a 'married' woman would wear such blazing attire. Well, in a caption, Simi revealed that her hubby Adekunle Gold said he liked it just like that! Simi was not the only one high on love during the trip. Even Adekunle Gold was thoroughly intoxicated with his affection for his bae. This caused him to launch into dancing the Nigerian way while on the ship. Seated at the edge of the blue sea, he danced nicely to a particular song playing in the background. Although he said he was dancing to the waves, it was evident that he was actually dancing for someone. Many of Simi and Adekunle Gold's fans could not keep quiet as seeing such expression. In line with a particular viral sentence, one of those who commented that Adekunle Gold was 'turningoniown'. Even musician Falz commented. falzthebahdguy: "Why our water and skies no blue like this? ��"
sedymichaelessien: "Adekunle is just turningoninown, the water is also turningoninown��"
r_e_d_diamond: "Good things come to those who believe. May the God who honored you honor me too, Amen." marvelafrik: "Awesome post congratulations on the promise [email protected] God bless and keep u both"
olivia4kings: "From today i declare you my best male artist in Nigeria." Also, it was not so long that Legit.ng shared photos of taking individual photos in Capetown. It would look like when it comes to showing off their love life to the world, the duo are making slow but steady progress.